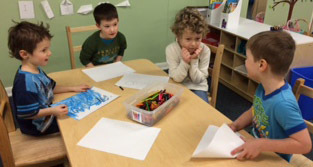 February for the Owls was true to our monthly poem, “The shortest month with lots of fun!” We covered many concepts such as friendship and sharing for Valentine’s Day, learning about mail and even practicing remembering our own addresses. 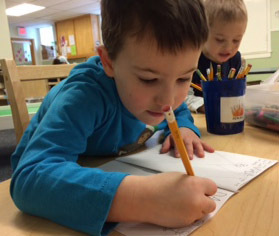 One of our main focuses has been enjoying a longer daily circle time, which now includes a simple writing activity from the curriculum Handwriting Without Tears (HWT). 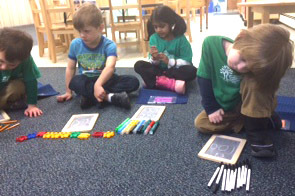 The Owls became really interested in writing numbers. They have grown so much in just this short month. 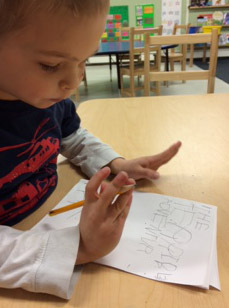 They have become accustomed to learning simple poems to practice writing their numbers. 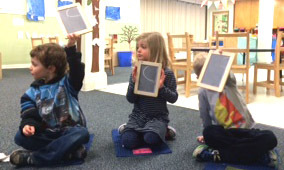 During this past month we completed 1-10 by using our mini chalkboards. 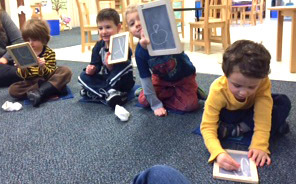 In using chalkboards, HWT teaches the child to use the entire chalkboard to create the numbers/letters. The curriculum uses a smile face in the upper left hand corner to remind students this is the starting point unless otherwise noted in the poem. Keeping with our numbers theme, the Owls celebrated their 100th day of school on February 25th. At drop off the “buzz” was all about how many items were in the math bucket! Could anyone guess? Everyone wrote “100” on their chalkboard. Drumroll, please! 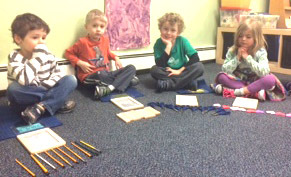 Finally at circle we all were able to count the items and there was 100! How did they all fit? 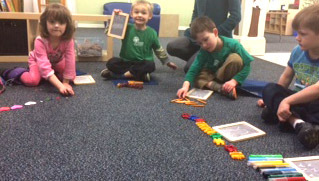 Ten Owls, and each Owl was able to count ten items. There were markers, pencils, scissors, buttons, blocks, paintbrushes, Lincoln Logs, pens, click blocks and hearts. Oh my! 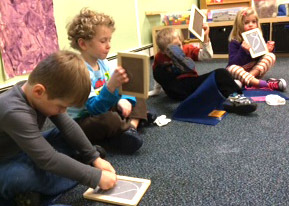 Even with all the number work we have been doing in the Owls room, play is our main focus. 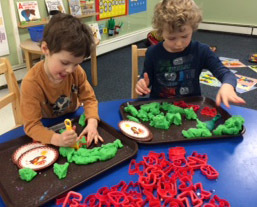 During free play you will find the Owls continuing to use the sandbox, blocks, and dramatic play while enjoying our open door multi-age groupings on Chickadees days. 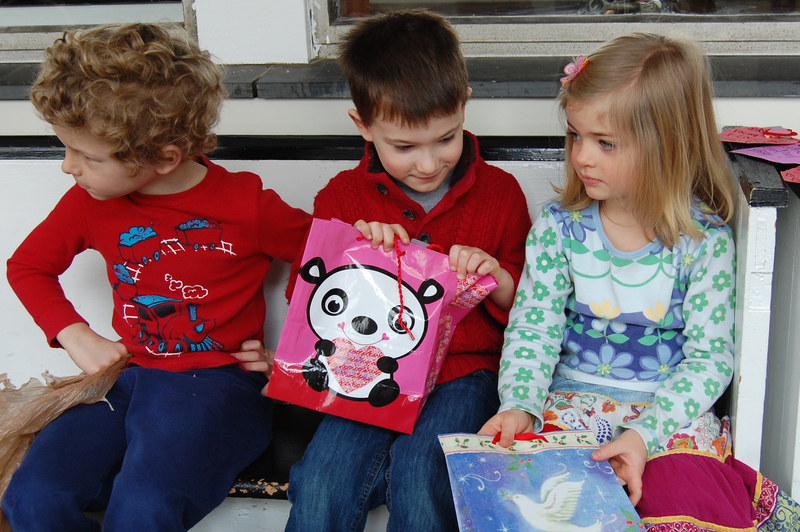 We also still continue to keep play based centers to keep our imaginations and exploration expanding. Nothing is more important than our daily play even as we mature this spring. 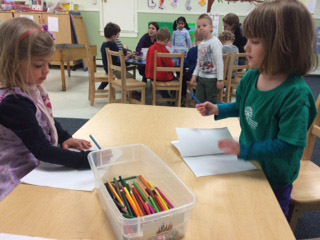 There has been a shift recently during free play from wanting to explore toys and manipulatives to creating drawings and books. Most mornings the children are busy at the drawing table working on multiple pictures or sometimes taking even forty minutes on a picture. It’s important to take this into consideration when drawings come home. 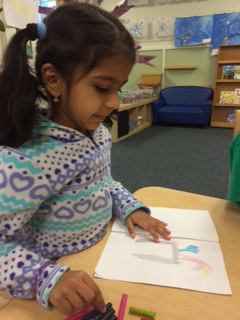 A general statement like “Can you tell me about your picture?” is a good conversation starter allowing the child to tell their story. Displaying your child’s art shows them that what they have done is important. Be on the lookout for more HWT in March with letters. We are also gearing up to talk about transportation and begin making our own types of transportation too. It will involve a BIG box!